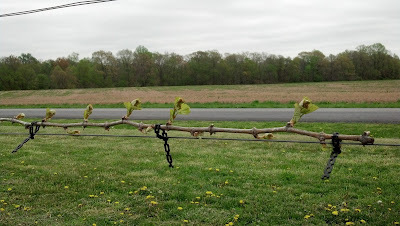 But since we are so early in the season, I thought I would start maybe a monthly " life of a chardonnay vine" so you can see how the vine grows, matures, produces, and ripens fruit in a single season. I picked chardonnay because its probably the most familiar grapevine we grow that folks would recognize the name. Our vineyard which is 22 acres has 8 different commercial varieties and 24 research varieties for the University of Maryland. 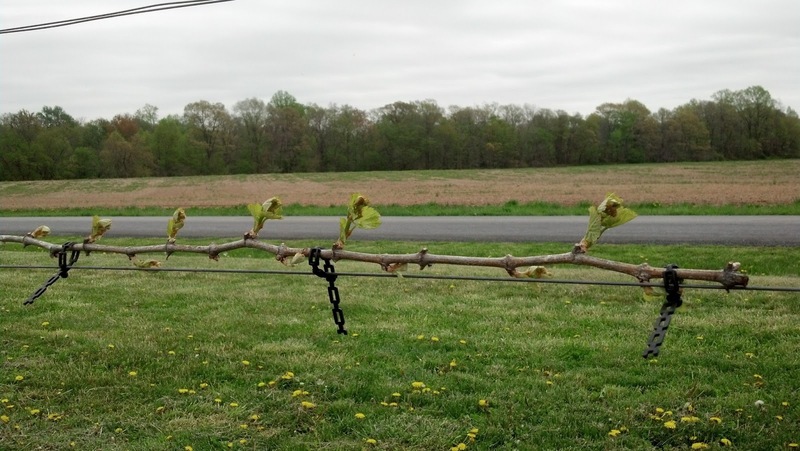 So here it is April 23, 2013 and this is a Chardonnay grapevine. You can see a couple things. 1. We had bud break last week. Chardonnay is an early variety and is typically in bud first. Budbreak is determined by soil temperature and variety. Our soils have not been warming up all that quickly so we are a bit late from usual budbreak timeframe. 2. We have "apical dominance" which is the tendency for the buds further out from the trunk to be longer and more developed than those closer to the trunk. One premise is that the energy of carbohydrates is pushed through the plant's vascular system toward the outer buds. You can see here that although the last bud on the far right did not "push", the second to the last bud is the most developed as compared to the buds to the left of the frame. The 3rd from the last bud also did not "push" but I can't say I paid attention to that when I was taking pictures so I will have to go back and investigate. 3. We cane pruned which means we laid down a new cordon arm, also known as the "fruiting arm". This is where all the fruit will hang this coming season. Cane pruning allows us to get rid of last years' cordon arm which may have residual spores or bacteria, and lay down fresh wood. We cane prune all our red varieties and all our vinifera varieties. We spur prune all our white hybrid varieties. What I don't see yet is frost damage. We had a frost yesterday morning. The kind where you have to scrape the windshield. So while I don't see any frost damage yet, I am watching closely as these young buds are so tender and so susceptible. We lost nearly 40% of our crop last year due to frost. I really don't want a repeat. So I will try to remember which plant this was (don't worry, I marked it) and you can follow this Chardonnay plant from April through September when we will be harvesting the fruit and delivering it to the winery!